The National and University Library in Zagreb (NSK) together with the International Internet Preservation Consortium (IIPC) are honoured to be hosting of the 2019 IIPC General Assembly (GA) on 5 June 2019 and Web Archiving Conference (WAC) on 6-7 June 2019 in Westin Zagreb hotel. 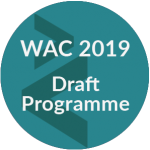 We are expecting around 100 IIPC members to participate in the GA, while about 150 international technologists, information and communication science researchers, librarians and archivists are expected to attend the WAC. Users, researchers and staff working in libraries, archives, universities and private companies will meet to discuss the latest global achievements in the development of tools, technologies, standards as well as share best practices of archiving content, enabling access and use of such content in analysis and research. It is an exceptional privilege to host the principal event of the web archiving community in the year when HAW is celebrating its 15th anniversary. Therefore, our goal is to cooperate with the best IT companies in Croatia and abroad that will present their products and services to this group of prominent international experts during the Assembly and the Conference. It would be our great pleasure if you would be interested to take part in these events by reviewing the opportunities listed in the sponsorship brochure. For any additional information regarding the sponsorship options please contact the Marketing and PR Department of the National and University Library in Zagreb at iipc@nsk.hr.